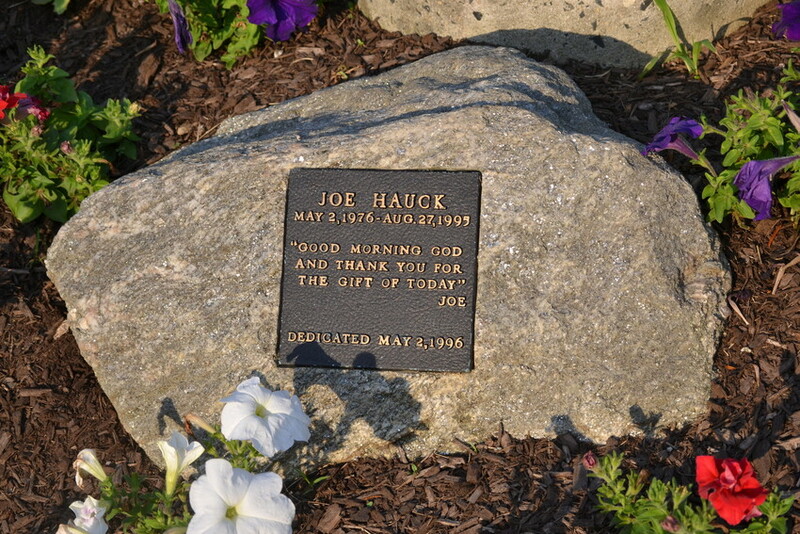 Anyone walking by Falvey Hall (aka Old Falvey) passes two memorials honoring Joe Hauck: a bench with a plaque and a small flowerbed planted at the base of a clock. 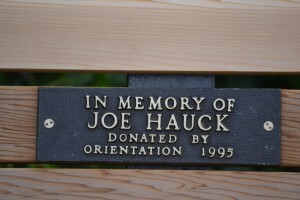 Have they, as I have, wondered who Joe Hauck is and why he was commemorated? A bit of research discovered that Hauck, a sophomore in the fall of 1995, was a member of the orientation team for incoming freshmen and an orientation counselor for Group 72. Orientation that year ran from August 24 through 27, and Hauck became ill on Saturday, August 26, during orientation. 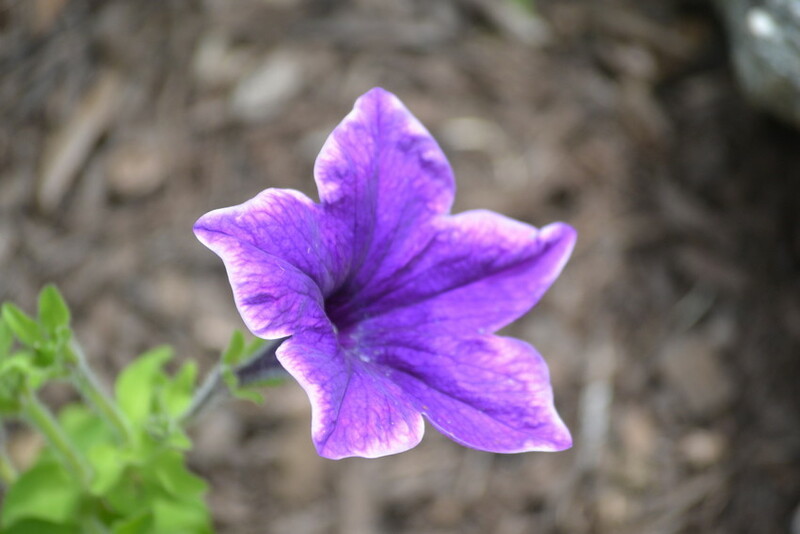 He went to his residence-hall room to rest, and at 1:30 a.m. Sunday Villanova Emergency Medical Service (VEMS) transported him to Bryn Mawr Hospital. Hauck was initially treated intravenously for heat exhaustion and vomiting, but at 4 a.m. his blood pressure dropped, he became unresponsive and soon died. His test results became available Sunday afternoon and showed that Hauck had meningoccal meningitis, a disease which is rare but very serious, evolves rapidly and can be fatal. Meningoccal meningitis causes the protective membranes covering the brain and spinal cord to become inflamed, and blood can become infected. It is contracted only through close personal contact, such as kissing, drinking from the same cup as an infected person or living in close quarters where the exchange of respiratory and throat secretions may occur. The University, in response, offered students a preventative antibiotic, Cipro, and many students took it. No other students developed meningococcal meningitis, though. In 2005, far too late to help Hauck, a vaccine became available, recommended for children ages 11 – 12, for high school students and for first-year college students living in dormitories. 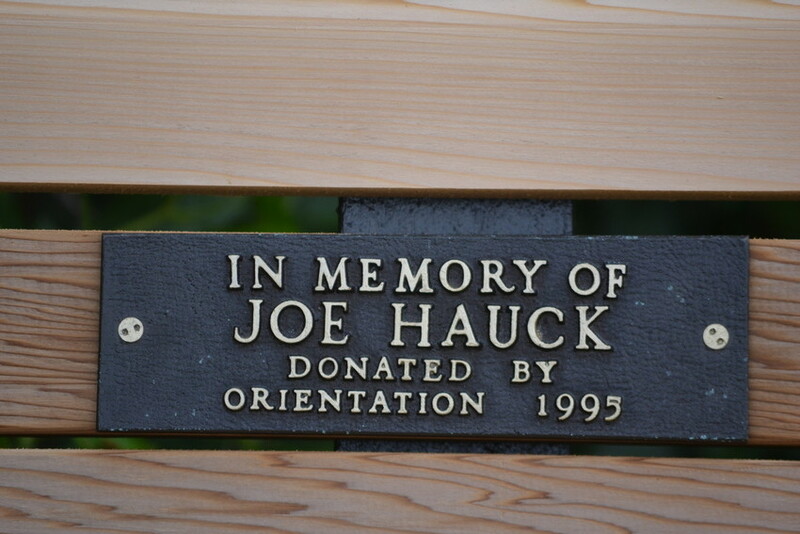 Hauck’s orientation team members and Group 72 described him as a free spirit with a warm smile; he was always happy and “[T]here was never a dull moment with Joe Hauck as our orientation counselor” (The Villanovan, 9/8/1995, p. 12). The memorials are gifts from the 1995 orientation team. 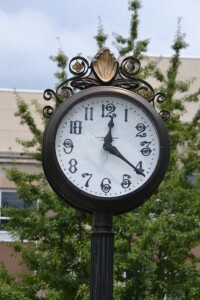 The clock memorial was unveiled May 2, 1996, on the 24th anniversary of his birth. A 1994 graduate of St. Joseph’s Preparatory School, Philadelphia, Hauck had considered becoming a priest, but he wanted to have a family so instead he was planning to be a doctor. He had served as a Eucharistic minister on campus and the plaque below the clock reflects his devotion: “Good morning God and thank you for the gift of today” – Joe. On the twentieth anniversary of this sad event, anyone walking past this memorial is reminded of just how transitory life can be, but also how one individual can be a positive influence on many others. Article and photography by Alice Bampton. I was an RA at Villanova and Joe was my resident. I can’t say enough about him, as a resident and as a person. His loss was felt all over campus even though he had only been at Nova for one year. I can’t say we were best friends or anything but I can say that I STILL think of him so often. Twenty years later, Joe remains with me. My life is better for having Joe Hauck in it, even though that time was too short. God bless, dear Joe. I was in group 72. I knew Joe for 3 days. My time with him at Nova changed my life. We walked in front of St. Thomas church and he said it is a glorious day and started singing glory to God in the highest. Less than 24 hours later he was with God. That was the first time I felt God’s presence and have Joe to thank. The way the school honored him made me realize what a special place Nova is even before my first class. I was in Group 72. Even though I only knew Joe for a few days, he was honestly one of the best people to this day I have ever met. He was so full of life and exuberated happiness. It was an honor to written a piece for The Villanovan on behalf of the group, for no one could have made us feel more welcome at Villanova. I still, all this time later, think of Joe very often. If someone in his family reads this, know that Joe remains a part of the lives of those who knew him and always will. I was also an orientation counselor that year. Joe was so full of life, incredibly kind, and could light up any room. I will never forget that morning after Joe passed when all of the Orientation staff were called into an emergency meeting in Dougherty Hall. Father Stack broke the news to us, and almost the entire room broke down crying in shock, sadness, and disbelief. He was just with us (and fine) the day before! Everyone had to stand in a long line outside of the Student Health Center where we were given one Cipro dose to take as a precautionary measure. I clearly remember hearing that although Joe was really sick on the way hospital, he was still cracking jokes and in positive spirits in the ambulance – a true testament to the amazing person Joe was.